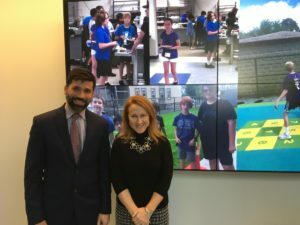 Arlington Education Foundation has partnered with the Belmont Savings Bank Foundation and the Arlington Public Schools to bring project-based learning to life at the Gibbs School with the installation of a media wall. 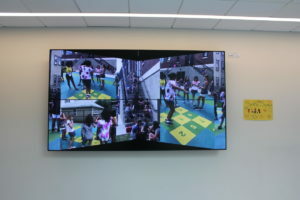 As you walk into the Gibbs School main lobby, your eyes quickly go to the four, 55-inch screens that showcase the learning experiences for our children. This media wall is the result of a partnership between the Arlington Education Foundation, our business partner Belmont Savings Bank Foundation, and the Arlington Public Schools (APS). The Belmont Savings Bank Foundation has been an AEF Business Partner for the past five years. This year the financial organization expressed interest in developing a more strategic relationship that would enable them to support a specific Arlington Public Schools initiative. Working together, AEF, the Foundation, and APS determined that the media wall would be the perfect project for the Foundation to support. Each organization provided the finances required to make the media wall a reality. The Belmont Savings Bank Foundation contributed $10,000 and the district supplied $12,000. The Arlington Education Foundation is committing an additional $10,000 for teacher professional development that supports project-based learning. The media wall is a way to showcase students involved in the various phases of their project-based learning projects to the larger community. The media wall will bring school work to life in a way that sixth grade students have not experienced before. Seeing their work on screen, shared with others, will be motivating and engaging. This will help the young people understand the value of their efforts. In project-based learning, students are asked to answer questions or solve problems, and communicate these results to others. The media wall is a new way for them to do this, helping them learn and refine essential, real-life communications skills. The four touch screens can operate as one large screen or independently. This makes it possible to display and explore four different projects simultaneously, creating personalized experiences for users. Computer skills will be enhanced as the students learn how to program and manipulate the touch screen software for presentations to the public. Additionally, the ability to present school activities in a public space will enhance the Gibbs culture and the school’s ties to the community.